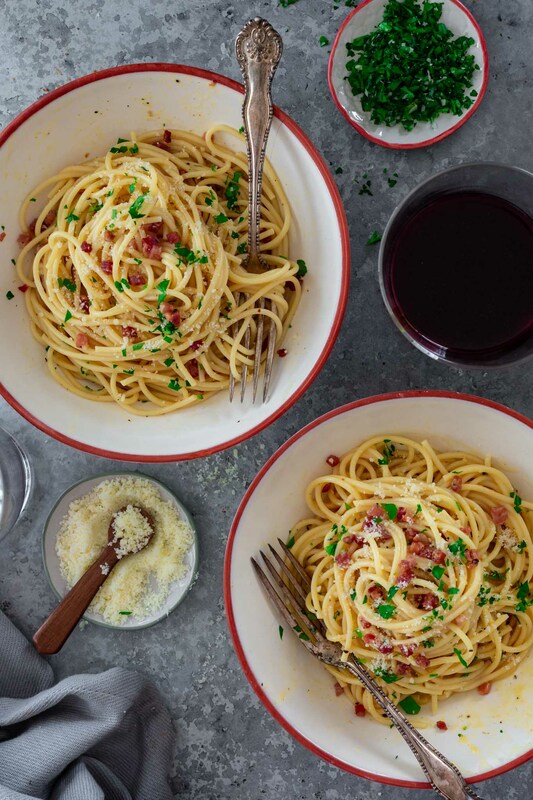 Italian Spaghetti alla Carbonara is a pasta dish that everybody should know how to make at home! Follow my tips and you’ll only need a few staple ingredients to make the easiest, creamiest, cheesiest Carbonara of your life. No cream necessary! I think it’s fair to say that I can divide my life into before and after spaghetti Carbonara. I simply adore it and if it’s on the menu, you can bet I’m gonna order it! I’d love to go back in time to slap some sense into that crazy girl. Because of her, I lived around 30 years without Carbonara in my life. And, for that, I’ll never forgive her! But what’s past is past and I’m looking forward to many years of eating what is now one of my favorite pasta dishes in the world. And the best part? It’s so easy to make it at home that I don’t have to wait til we go out to an Italian restaurant to eat it. 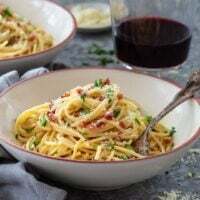 My version is inspired by the Spaghetti alla Carbonara that I had in Rome, which is different from the American version as there is no cream added. The creaminess comes solely from the egg sauce. Because of that, you’ll have to be careful not to end up with scrambled eggs instead of the velvety sauce that makes this dish so special. It took me a while to perfect it, but I think I have found the best technique to make it perfect every single time! This recipe is portioned for two, as I think this makes a great romantic Valentine’s Day dinner. But it is easily doubled or tripled if you want to serve it to your family or at a dinner party! 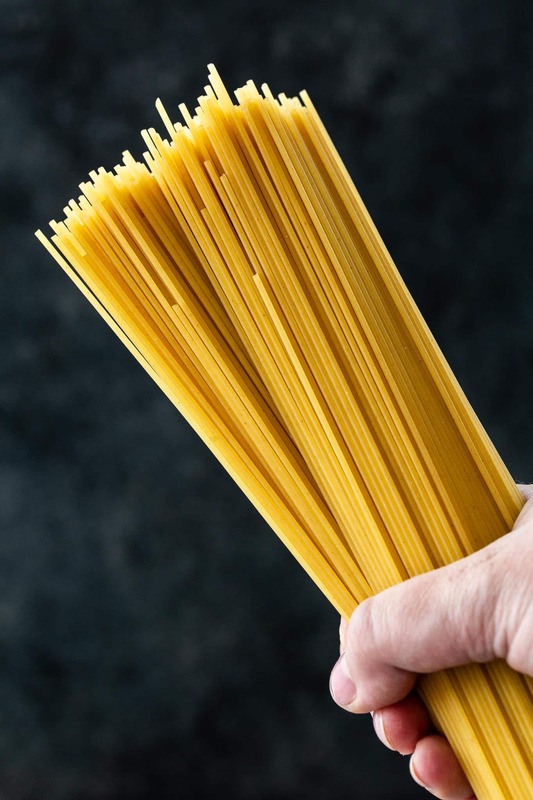 As is the case with many popular dishes, the origins of Spaghetti Carbonara are obscure. Even though it is known as a Roman staple, it is a relatively new dish, probably developed in the post-war years. In fact, Pasta alla Carbonara is unrecorded – at least with this name – until the 50s and 60s, when it started appearing in cookbooks and culinary guidebooks. There are many tales that tell how carbonara came to be. Since the name comes from carbonaro, which is the Italian word for a man who makes charcoal, some believe that the dish was created as a hearty meal for those workers, or that it was invented as a tribute to the Carbonari, a secret political society that sought to defend the rights of the people against all forms of absolutism. To me, it seems more likely that carbonara was an urban dish during the post-war years, cooked in charcoal burners on the streets of Rome, and eaten by the bowl. Since there is no agreeable origin of carbonara, there’s also no exact recipe. 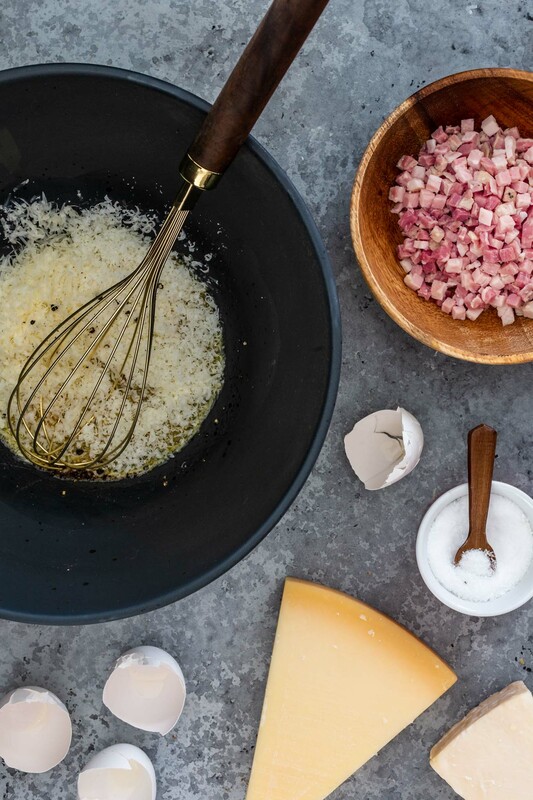 Depending on the cook, carbonara can be made with cured pork (usually guanciale), whole eggs or egg yolks only, Pecorino Romano or Parmegiano Reggiano (or both), and black pepper. Purists will twist their noses at using pancetta instead of guanciale and at additions like garlic or onions. 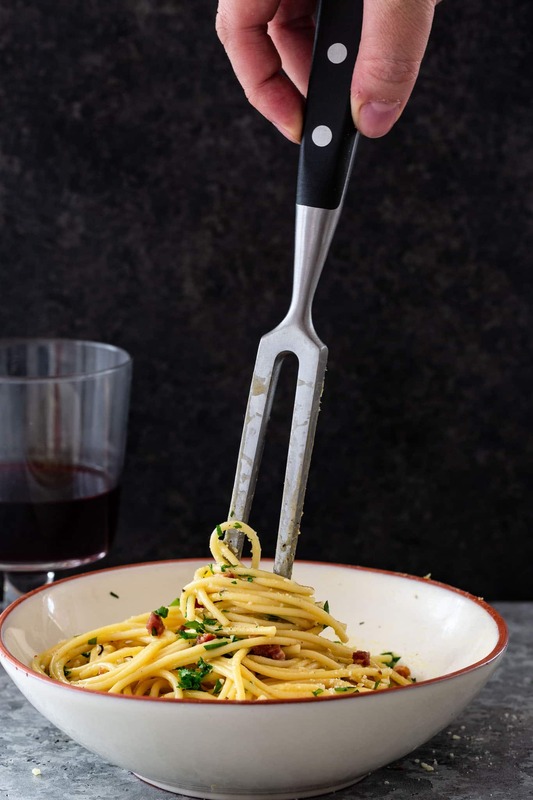 However, since carbonara is a dish that has no definite origin or recipe, and that has changed so much over the years, I don’t think it’s right to think of it as a fixed thing. There is no “right way” to make it! So use whatever ingredients are accessible to you. More important than the ingredients is the technique you use. It is nothing complicated, so no reason to be intimidated. The difficulty is that you need enough heat to cook the eggs without scrambling them while melting the cheese at the same time. The egg will start scrambling at 145 degrees F, so cooking it on the stove is out of the question. I also find that relying only on the heat of the cooked is not enough, as we need a little more heat than that. You will find a bunch of different suggestions in other recipes, including tossing everything together on a double boiler. 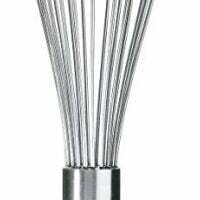 What I like to do is drain the water that I used to cook the pasta into a large mixing bowl. 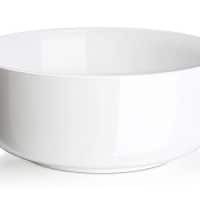 The water will heat the bowl just enough and then we can drain it, wipe it with a kitchen towel and use it to toss the pasta and egg cheese mixture until the sauce is smooth and the cheese is melted. Does authentic Carbonara have cream? Authentic Italian carbonara does not call for cream. During my trip to Italy I had carbonara more times than I care to admit, and not once it had cream in it. However, here in the United States, 9 out of 10 times I see it in restaurants, it is served as a cream based pasta dish. That used to drive me crazy, until I had one recently that knocked my socks off! But, for now, put the heavy cream away! 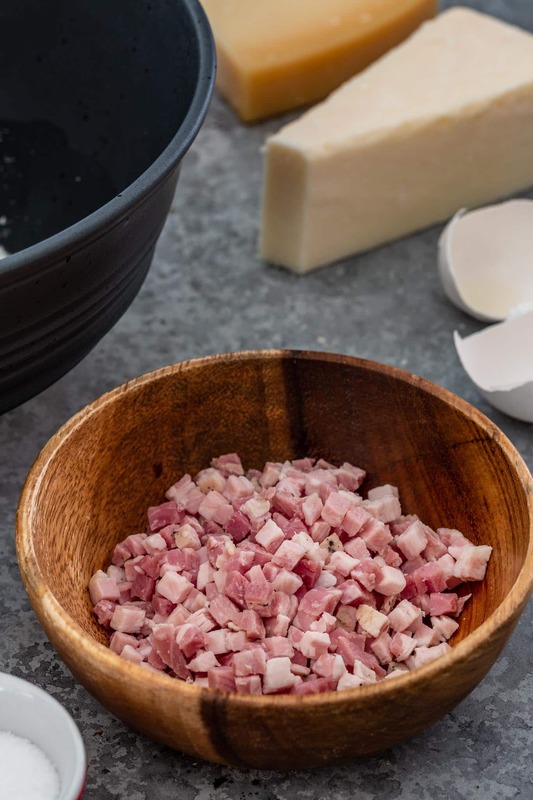 If you ask an Italian chef, he or she will tell you that true carbonara is made with guanciale, and not pancetta or bacon. Well, first of all, I’ll take my carbonara any way I can get it! Also, not only guanciale is very hard to find in the US, but it is also much more intense than pancetta or bacon, and therefore not for everyone’s palates. In short, pancetta or bacon are fine substitutes. Use whatever you like best and is easily available to you. 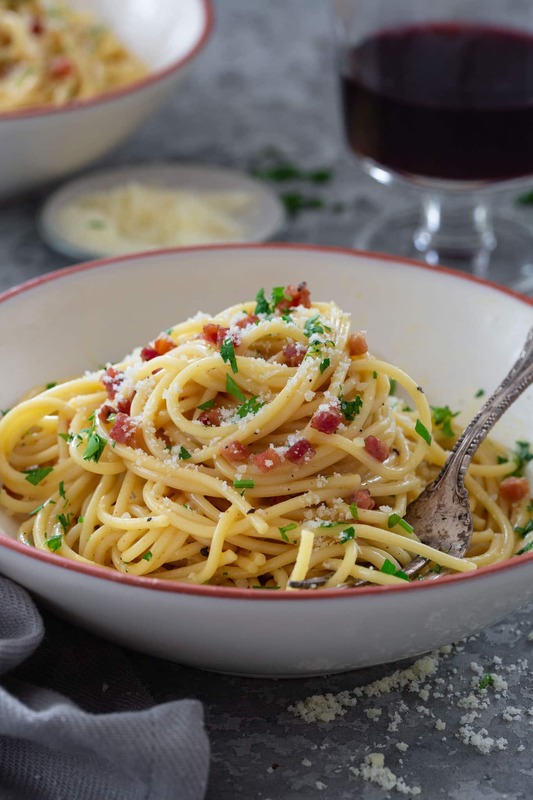 You can find already diced pancetta in most grocery stores, which is very convenient, especially when making a quick dish like Spaghetti Carbonara. What is the best pasta for carbonara? 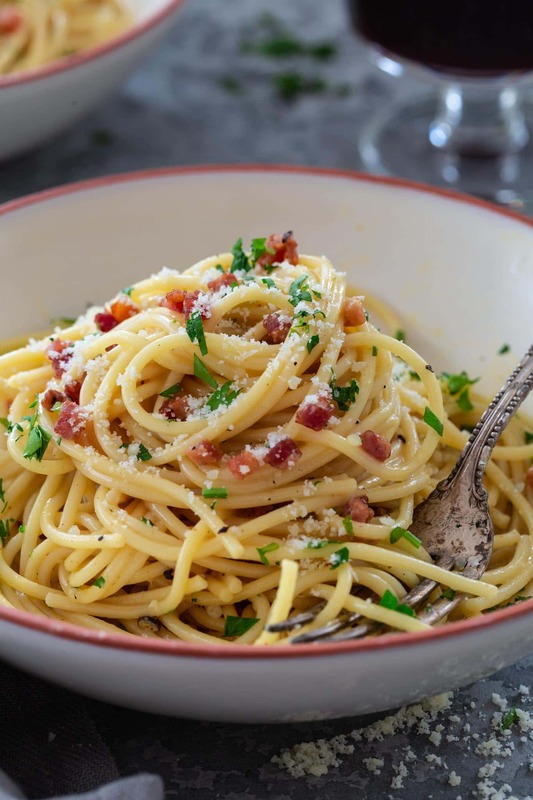 Carbonara can be made with several different pasta shapes, but most frequently with spaghetti or bucatini. I’ve also seen some recipes call for penne or rigatoni. I find that long shapes are best for creamy sauces, so that’s what I use. I also like to use dried pasta but feel free to use fresh if you prefer, being extra careful not to let it get mushy during the many cooking steps, as carbonara should always be al dente! Using cold eggs. I like to take mine out of the fridge at least 30 minutes before using them. Room temperature eggs will be easier to work with when binding the sauce. Not mixing the egg sauce before tossing it with the pasta. I whisk everything together in a separate bowl and then add to the hot bowl with the pasta and pancetta. That way the sauce is halfway done and only needs to thicken and cling to the pasta. Tossing the pasta and egg mixture on the stove. As I said before, we do not want scrambled eggs! My technique of using the pasta water to heat a mixing bowl will generate enough heat to cook the eggs without scrambling them. Not adding a little pasta water to the sauce. The starchy pasta water will help bind the sauce and will make it creamier. Start with a little bit (1/2 cup) and add more as needed. Not working quickly enough. Once the pasta, pasta water, pancetta and custard are in the bowl, it is time to work those tossing muscles. You want the sauce to cling to every strand of pasta and the heat to move around, helping the eggs to cook and cheese to melt. Wait too long and you’ll end up with a raw, runny sauce that will collect on the bottom of the bowl instead of hugging your pasta. Can I reheat Pasta Carbonara? You know what I’ll say, don’t you? I’m not a fan of reheating pasta, as it will never be as al dente as when freshly cooked, so I usually try to cook just what I need. Fresh is always best! That being said, you are obviously not going to throw away leftover spaghetti carbonara! You wouldn’t dare! But don’t even look at your microwave. Resist the temptation! The best way to reheat it is to boil a few tablespoons to 1/4 cup of water (depending on how much leftovers you have) in a sauce pan, and then lower the heat and add the leftover carbonara. Simmer, stirring it gently, until warm. Bring a large pot of salted water to a boil. 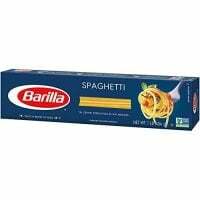 Add the spaghetti and cook until almost al dente (about 2 minutes less than package instructions). While the pasta is cooking, mix the egg, egg yolks, cheese, salt and pepper in a medium bowl. Reserve. Heat the oil in a large skillet, over medium-high heat. Add the diced pancetta and cook until crispy and golden brown, about 5 minutes. Remove the pan from heat and reserve the pancetta with about 3 tablespoons of the rendered fat. When the pasta is done, drain it in a colander set over a large mixing bowl, letting the hot pasta water heat the bowl. Reserve 1 cup of the starchy water. Discard the water and use that bowl to toss the pasta with the pancetta, reserved fat, egg mixture and 1/2 cup pasta water. Work quickly, tossing vigorously and adding more pasta water if necessary, until the sauce is silky and the cheese has melted completely. You can add more salt and pepper if needed. Garnish with chopped parsley and serve with extra Parmigiano Reggiano at the table. « Molten Dulce de Leche Cakes for Two!